I am ashamed to see the Australian politicians being smarter than Obama and our American politicians. The inconvenient truth is that the earth's temperatures have flat-lined since 2001, despite growing concentrations of C02. Peer-reviewed research has debunked doomsday scenarios about the polar ice caps, hurricanes, malaria, extinctions, rising oceans. Read it all in the Wall Street Journal. While suturing a cut on the hand of a 75-year old rancher, whose hand was caught in the gate while working cattle, the doctor struck up a conversation with the old man. Eventually the topic got around to politics and Obama as our president. 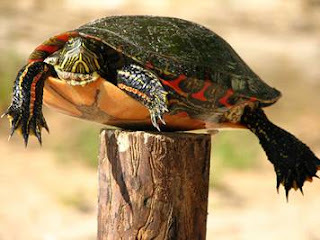 The old rancher said, "Well, ya know, Obama is a post turtle." Not being familiar with the term, the doctor asked him, "What is a post turtle?" The old rancher saw the puzzled look on the doctor's face so he continued to explain. "You know he didn't get up there by himself, he doesn't belong up there, and he doesn't know what to do while he's up there, and you just wonder what kind of dumb #%! put him up there to begin with." After ten straight years of global cooling, Mr. Obama hails the House-passed "cap-and-trade" bill to combat the (mythological) man-made global warming. In true Orwellian double speak, Obama calls cap-and-trade a "jobs bill." What a whopper. What he means is, he wants to give jobs to some greenie friends while taking jobs away from anyone whose living may be affected by higher energy costs. I used to think Jimmy Carter was the worst president in my lifetime. Obama proposes to reduce health care costs like providing a government-owned alternative to private insurance and -- get this-- by taxing employers more when they give health care benefits to their employees. of course, he also proposes to penalize employers who fail to give health care benefits to their employees. In other words, he wants to punish people for being employers. The United States Supreme Court has now issued its decision in RICCI ET AL. v. DESTEFANO ET AL., slip op. Overruling a Circuit Court of Appeals decision in which Supreme Court Justice candidate Sotomayor participated, the Court upheld a reverse discrimination claim by New Haven, Connecticut, firefighters who had passed a test for promotion, thrown out because too many whites and hispanics scored too highly. The City of New Haven, at great expense, hired a firm to prepare a test that would be race neutral. According to the evidence, the firm bent over backwards to make certain that the test would be race neutral, and purely job skills-based. They interviewed a disproportionate number of minority jobholders to make certain that the test questions would be race neutral. Still, all of the highest scorers on the test were white and hispanic. Firefighters who passed the test testified to the great sums of money and time they invested in preparation for the test. Eric Holder's Department of Justice will sponsor a booth at an event run by the Islamic Society of North America, an unindicted co-conspirator on terrorist funding in the Holy Land Foundation criminal prosecution, according to hotair.com. It was the Department of Justice that named them as an unindicted co-conspirator. Is he out of his mind? Is it now DoJ policy to support suspected criminals? As I listen to President Obama's tepid response to the cruel murders of protesters in Iran, which brings back memories of Tianamin Square, I realize something subtle, or maybe not so subtle, that bothers me about him. When he speaks about America, he lacks any sense of passion for America, for liberty, for freedom from tyranny. Listen to John F. Kennedy when he said in his inaugural address: "Let every nation know, whether it wishes us well or ill, that we shall pay any price, bear any burden, meet any hardship, support any friend, oppose any foe, in order to assure the survival and the success of liberty." Where is the passion for liberty? Where is the passion for America? You decide if this is the kind of leader you want for America. There will be an election in 3 1/2 years. More news of getting rid of folkis whose job it is to rrot out federal government corruption: The firing of Gerald Walpin as Inspector General was not an isolated incident, as the Chicago Tribune reports today. Two more IGs have been dismissed in the past two weeks, and Senator Charles Grassley has started demanding answers. The sudden push to rid the government of independent watchdogs appears to coincide with Barack Obama’s plans to use government spending to get control over more aspects of American life....Obama is developing a pattern of interfering with the independence of Inspector Generals. Read it all. The Obama administration tacitly admits its corruption in the firing of Gerald Walpin, in much the same way a burglar admits the crime by running from the police. The Obama administration refuses to answer Senate questions about the reasons for the firing, as reported in the Washington Examiner. The New York Times files its brief arguing on behalf of the Obama administration, of course, but dutifully (and probably reluctantly) reports the reason that the firing appears to be corrupt. More on the firing of to cover up Obama's corrupt friends. Obama now says Mr. Wilkes was confused in a meeting and other trumped up nonsense. Let’s unwind the timeline a bit to test this new allegation. Walpin pressed hard to prosecute Sacramento mayor Kevin Johnson for defrauding the government over more than $400,000 in community service grants. Johnson, an Obama supporter, got a deal from the White House that allowed him to manage federal funds again and avoid paying back at least half of the grant money he used illegally. The White House cut Walpin out of those negotiations, and Walpin went to Congress about it. Now he wants the power to nationalize companies according to the Los Angeles Times. Does anyone in Congress have the courage and savvy to stop it? Mark Steyn makes the point: Obama says he wants to reform health care to control costs. The only way to control costs is to have less of it. Read it all. The Obama White House has fired an Inspector General investigating corruption by one of Obama's friends. Gerald Walpin an inspector general who has prosecuted corrupt Republicans and Democrats alike has been fired. Under a law supported by then Senator Obama, an administration could not fire an inspector general without giving Congress 30 days notice and the reasons for the firing. Obama's reason given: He says he is no longer comfortable with Mr. Walpin. Not comfortable? That is a reason? Read about it here. This should be a serious corruption scandal in and of itself. Will the MSM cover it? Will Congress Corrupticrats investigate? Don't hold our breath. Another case of guns fighting crime. Would be victim shoots teen robber who was holding a shotgun on the victim. Marxism coming our way at a gallop, socialism first though: The Obama administration says executive compensation must be better managed to prevent the sort of risk-taking that jeopardizes the economy.Apparently this notion of government managing private business is coming, this time, from an advisor to tax cheat Treasury Secretary Timothy Geitner. Not surprisingly, the Obama porkulous bill has failed to get the unemploymenbt rate under control. Typical of liberal solutions to ecomonic problems, the porkulous bill is making things worse. The Bureau of Labor Statistics announced Friday that May's unemployment rate soared to 9.4 percent. Once again, Obama administration predictions on the economic impact of the $787 billion stimulus plan have proved wrong. After the stimulus bill was signed into law on Feb. 17, the Obama administration predicted that the unemployment rate this year would average just 8.1 percent. Even as late as May 11, Ms. Romer didn't think the unemployment rate would reach 9.5 percent until December. What is stunning is the speed at which the unemployment rate is increasing.Read it all. Join a tea party near you on July 4, 2009.